A General Map of the Middle British Colonies, in America. 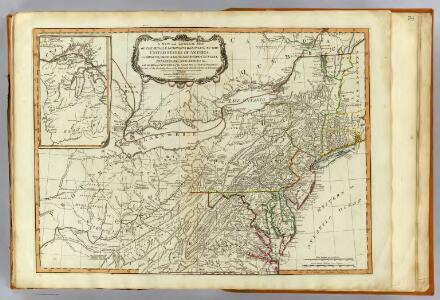 Bowles's new pocket map of the following independent states of North America: viz. Virginia, Maryland, Delaware, Pensylvania, New Jersey, New York, Connecticut & Rhode Island: comprehending also the habitations & hunting countries of the confederate Indians / by Lewis Evans. A Map of the British Empire in America. (Sheet 6). A New Map Of The Seat Of War. 130-31. Ohio, Penn., N.Y., Vt., N.H., W.Va., Va., N.C.
New York, New Jersey, Pennsylvania, and Delaware.